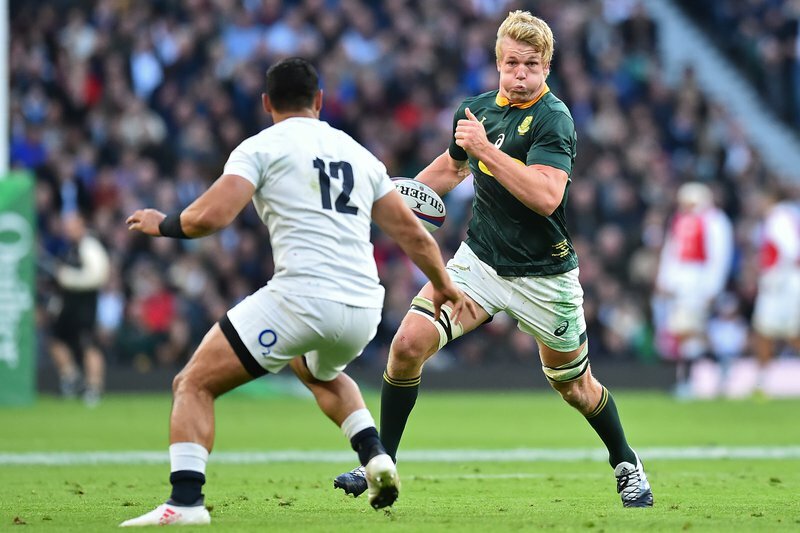 Pieter-Steph du Toit produced a remarkable feat when he was named the SA Rugby Player of the Year for 2018 on Thursday, marking the second time in three years that the athletic Springbok forward scooped the top award in South African rugby. The 26-year-old Du Toit, who has collected 46 caps since his Test debut in 2013, was sublime in the green and gold last year. His efforts on the field saw him edge out fellow Boks Aphiwe Dyanyti, Franco Mostert, Handré Pollard and last year’s winner, Malcolm Marx, for the top award. “This is a magnificent achievement for Pieter-Steph and very well deserved after a superb season for the Springboks and the DHL Stormers. On behalf of the entire South African rugby fraternity, I would like to congratulate him,” said SA Rugby President, Mr Mark Alexander. The Springbok Sevens team and their coach, Neil Powell, recorded a unique double when they were rewarded for another superb season in which they successfully defended their HSBC World Rugby Sevens Series title in dramatic fashion, by winning the awards for Team and Coach of the Year. Dylan Sage, who made the HSBC World Rugby Sevens Series Dream Team for 2017/18, was named Springbok Sevens Player of the Year. “For the second successive season Neil, Philip Snyman, Dylan and their band of Blitzbok brothers made us all very proud, and yet again they deserve walking away with these awards,” said Mr Alexander. Exciting midfielder Wandisile Simelane won the award for Junior Springbok Player of the Year and Nolusindiso Booi, the Springbok Women’s captain, was named the Women’s Achiever of the Year for 2018. Springbok tourist Sergeal Petersen, who scored eight tries in eight matches for DHL Western Province last year, was the Currie Cup Premier Division Player of the Year, while the Valke’s Etienne Taljaard, with 13 tries in seven appearances, won the accolade for the First Division. The SuperSport Rugby Challenge Player of the Year Award went to Chris Smith of the ISG Pumas – he scored 131 points for the eventual champions of the series – and Evan Roos of DHL Western Province was the Craven Week Player of the Year for 2018. Jaco Peyper, who refereed his fourth Currie Cup Premier Division final as well as a Vodacom Super Rugby semi-final and several important Tests, was named the Outsurance Referee of the Year. “Our very hearty congratulations go to all the winners on their achievements last year. Judging by the way in which these players and teams performed in 2018, and the fact that we’re in a Rugby World Cup year, I can’t wait for 2019’s action to pick up steam,” said Mr Alexander.